Seymour was a good and pious man, and when he passed away, the Lord himself greeted him at the pearly gates of heaven. While eating this humble meal, Seymour looked down into Hell and noticed the inhabitants devouring enormous steaks, pheasant, pastries and vodka. 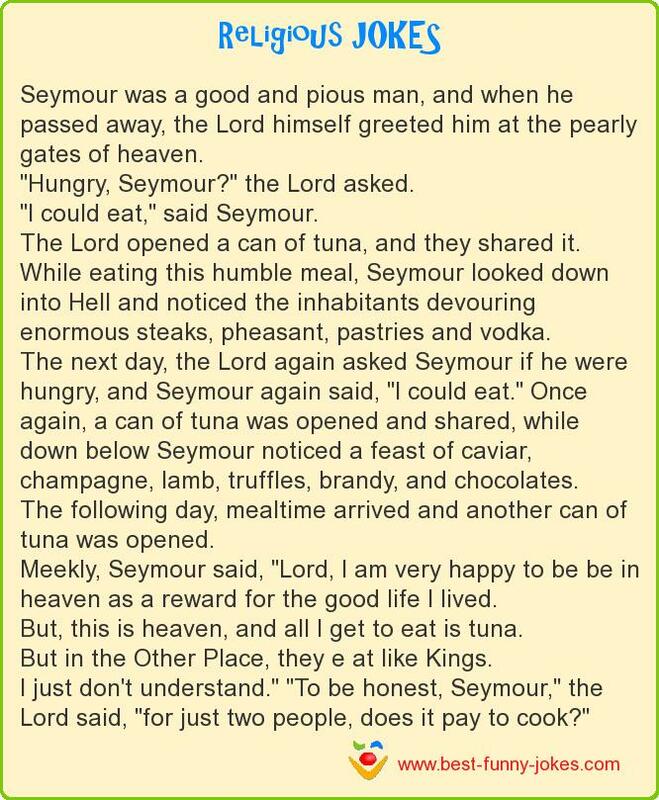 The next day, the Lord again asked Seymour if he were hungry, and Seymour again said, "I could eat." Once again, a can of tuna was opened and shared, while down below Seymour noticed a feast of caviar, champagne, lamb, truffles, brandy, and chocolates. Meekly, Seymour said, "Lord, I am very happy to be be in heaven as a reward for the good life I lived. But, this is heaven, and all I get to eat is tuna. But in the Other Place, they e at like Kings. I just don't understand." "To be honest, Seymour," the Lord said, "for just two people, does it pay to cook?"